Barrier-free tolling at Boulay: How can we help? Which payment methods do you accept at Boulay? You can pay for your journeys within 10 days using a bank card online (preferred solution) or at the terminals located at the Boulay toll car parks. You can subscribe for free to the Subscriber Pass to automatically pay for your journeys once a month. • You can also top up your Prepaid Pass online or at the car park terminals. Cards accepted: Eurocard / Mastercard, Visa, Maestro, Electron. You can pay for your journeys online within 10 days using a Total or DKV card. You can pay for your journeys at a terminal within 10 days using Total GR, Shell, DKV, Eurotrafic (Total and Fina) or Ressa cards. You can also subscribe for free to a Subscriber Pass using your Total and DKV cards to automatically pay for your journeys each time you pass a toll gantry. You cannot use a Prepaid Pass. 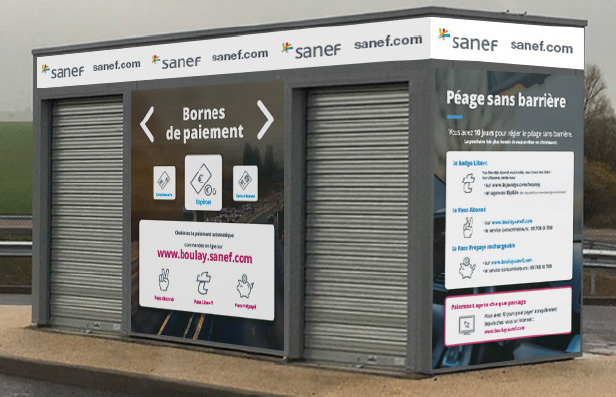 You can pay for your journeys within 10 days in cash at the payment terminals located at the car parks at the Boulay toll entrance and exit. You can also order and top up a Prepaid Pass at the terminals. What is the difference between a Subscriber Pass and a Prepaid Pass? With the Subscriber Pass you can link a bank account, bank card or company card (fuel card) to a tag that is automatically detected by the gantry. Then you can drive through without having to worry about the payment. With the Prepaid Pass, you top up your tag with the desired amount, as and when you need to. In both cases, we will warn you if your card is about to expire or if your balance is low. How can I buy a Pass? To buy a Subscriber Pass,, you just need to create a customer account on our website and link up a payment method. If you want to pay by bank card or bank transfer, you will be debited once a month. If you choose to pay using a company card or a fuel card, you will be debited after each journey. Once you have created your customer account, your Subscriber Pass will be sent free of charge to your address. To buy a Prepaid Pass, you just have to create a customer account on our website, choose how much to top up your Pass (€10, €20, €50, or €100) and pay using a bank card. If you want to top up your Pass using cash, you can do so at the terminals located at the car parks. NB: You can buy a Prepaid Pass without creating an account at the terminals. How do I top up my Prepaid Pass? You can top up your Prepaid Pass online by logging in to your customer account. You just select the tag you want to top up, choose how much to credit, and voilà, it's done! You can also top up your Pass at the terminals located at the car parks at junction 38 by logging into your customer account if you have set one up, or by entering your Prepaid Pass number. You even have the option to scan the barcode on the detachable part of your tag. You can top up your Pass at a terminal using a bank card or cash. How can I replace my Pass? Will my balance be transferred? Do you want to transfer the balance from your Pass to another tag? You can do this online through your customer account. You just need to order a new tag and request a balance transfer by calling our customer services on +33(0)9 708 08 709 (standard rate). If you do not have a customer account (Anonymous Prepaid Pass from a terminal), you can get a new Pass but you cannot transfer the balance. You can request that your customer account be closed at any time, online or by contacting our customer services. If you have a Subscriber Pass, you must pay any outstanding amounts. If you have a Prepaid Pass, any remaining balance on your tag will be refunded. If you have an Anonymous Prepaid Pass (without a customer account), you cannot get a refund. You can pay in cash after you pass the gantry at the payment terminals located at the Boulay toll car park. They are accessible to people with limited mobility and under cover. How do I pay my toll if I don't have anything to pay with? Oh dear! You're on the motorway without cash or a bank card. Don't panic! There's no cause for alarm with the barrier-free toll. You have 10 days to pay for your journeys. And if you're someone who often misses deadlines or who always forgets their wallet or their purse, it might be a good idea to go for automated payment with a Liber-t tag or the Subscriber Pass! How will I be charged if I have a Subscriber Pass? So you’ve opted for a Subscriber Pass? The first time you use it, you will be debited within 24 hours. All your journeys will then be debited the following month. I am a company, how can I buy Passes for my fleet of vehicles? For you, companies, it is possible to order Subscriber Passes for your fleet of vehicles. Please contact the customer service at +33(0)9 708 08 709 (standard rate) from Monday to Friday, from 8 am to 6 pm or contact us via the online form by clicking here. You can associate a credit card or a Total or DKV fuel card with the vehicles you want to equip with free RFID tags. You can also use the IBAN as a means of payment (this service will be available soon).